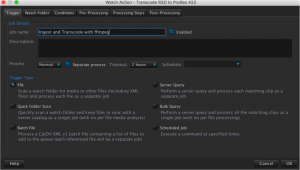 This document will show how to set up transcode using FFmpeg controlled by the CatDV Worker. 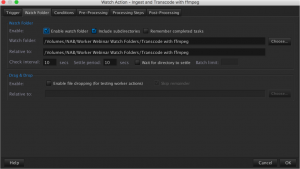 FFmpeg is a powerful, open source, cross platform encoder. It’s home is here. There are several pre-built FFmpeg distributions available for Mac and Windows (here) or it can be compiled yourself (which can be useful if you want to use third party extensions to FFmpeg, for example to burn in text or subtitles). There is a good tutorial for installing FFmpeg with extensions on Mac here and for Windows this site offers custom ffmpeg builds on request. This tutorial is based on OS X installed as above, with FFmpeg 2.1.3 and extensions allowing text burn in. In a terminal window, run ffmpeg, i.e. type the command above. If FFmpeg is installed correctly you should see the version number and other configuration information. Next we can choose which media this action should work with. In this case “All known media types” are selected. Now on the “Conversions” tab we will tell the Worker to run ffmpeg. 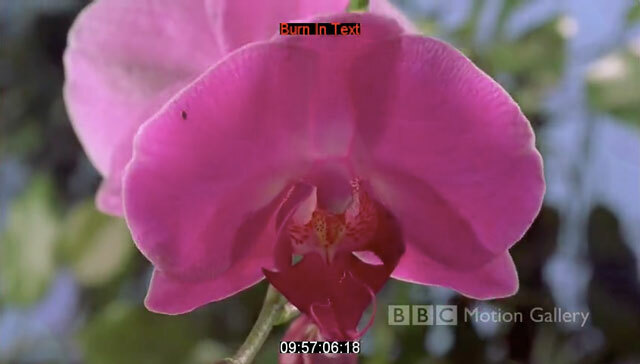 There are many options for ffmpeg including formats, frame sizes, watermarks, burn ins etc. The reader is encouraged to explore these settings for their workflow. 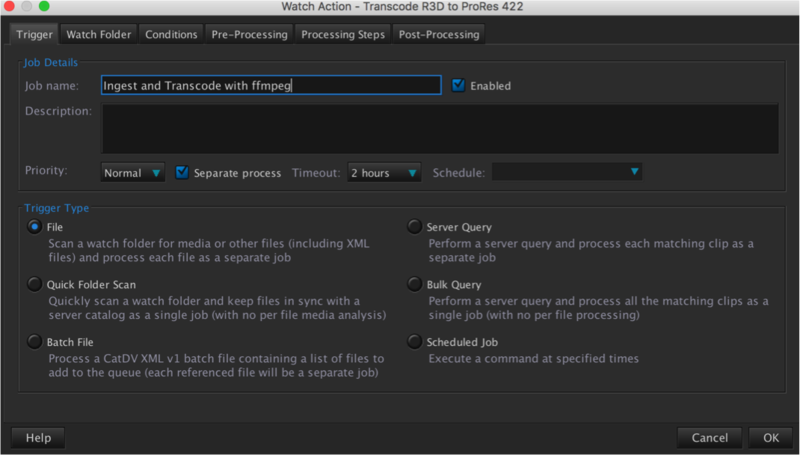 In this case we shall transcode to H.264 for the web. /opt/local/bin/ffmpeg -i $b -codec:v libx264 -movflags +faststart -preset slow -crf 30 -vf scale=320:-1 -codec:a aac -strict -2 -vf "[in]drawtext=fontfile=/Library/Fonts/Arial.ttf: timecode='09\:57\:00\:00': r=25: \x=(w-tw)/2: y=h-(2*lh): fontcolor=white: fontsize=32: box=1: boxcolor=0x00000000@1, drawtext=fontfile=/Library/Fonts/Arial.ttf: \text='Burn In Text':  \x=(w-tw)/2: y=(2*lh): fontsize=32: fontcolor=red: box=1: boxcolor=0x00000000@1[out]”  "/Volumes/NAB/Worker Webinar Outputs/ffmpeg Transcodes/$g.mp4"
-i $b Sets the input file to be a CatDV variable $b, the full input file path. A full description of CatDV variables that can be used in the command line is here. -vf scale=320:-1 Sets the width of the clip to 320, -1 for the height keeps the aspect ration the same as the source clip. Several variables are supported in i.e. h/2 is half the height of the original clip. There’s good information on resizing with ffmpeg here. -codec:a aac -strict -2 Sets the audio format to be arc, using the built in aac encoder. This is a fairly low quality encoder but is bundled with most pre-built ffmpeg distributions. Other audio encoders are available, see here for other options. 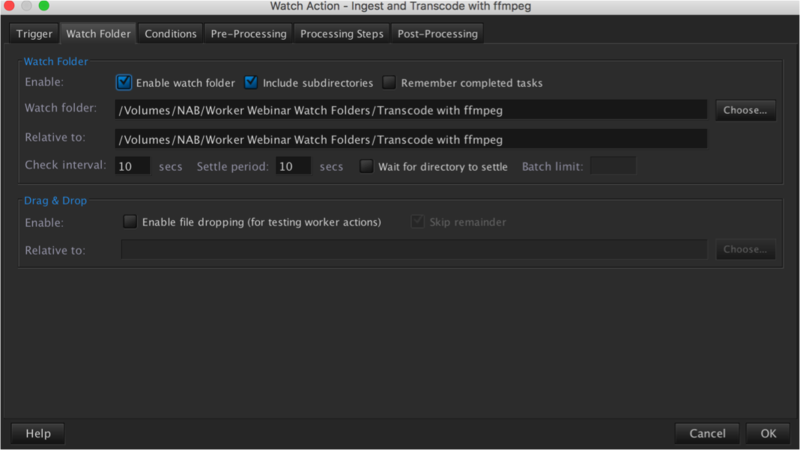 “/Volumes/NAB/Worker Webinar Outputs/ffmpeg Transcodes/$g.mp4” Determines where to write the output file. In this case we are using another CatDV variable: $g is the file name (i.e. with none of its path) and without any file extension. 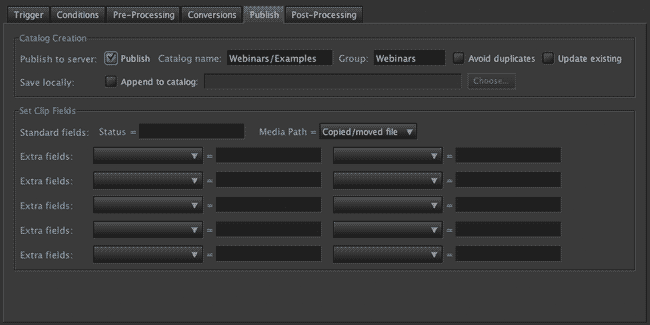 This means all output files we create will have the mp4 extension. There are many other options provided by FFmpeg which can be useful in real world workflows, for example -y and -n control whether files are overwritten or not. Now save the Worker action and return to the main Worker queue.